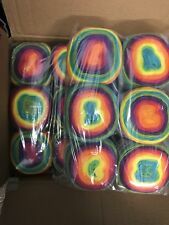 New listingYarnArt Ambience Multicoloured double knitting Yarn Wool Acrylic 5 x 100g 152. Due to the colours being pretty consistent, dye lot does not tend to matter with mandala yarn. 150g - 590 yards / 540m per cake. This delicious soft cake yarn is #3 weight (double knitting to us in the UK, light worsted in US lingo) and beautiful blends of colours that take care of colour changes for you. Never pay more than £2.95 for UK 2nd class Postage! Designed by Alize, Puffy is a new way of knitting without needles. It is knitted using only your fingers! 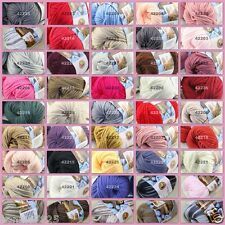 Perfect for scarves, blankets (especially baby blankets) throws etc because of its exceptionally soft handle. Felters can achieve thick, sumptuous fabrics by knitting, weaving or crocheting Bella, then throwing it in the washing machine or hand felting for brilliant results. Bella pure British wool roving is a gorgeous soft lightly twisted yarn suitable for many textile crafts. 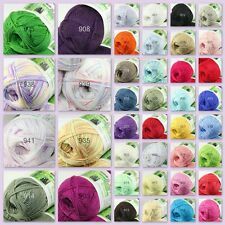 1 Quality 100% Pure Recycled Silk Sari Ribbon Yarn. It is the loose ends of saris collected from industrial mills in India that is hand spun into yarn in Nepal. The vibrant colors and unique texture of these silk fibers and silk yarn are inspirational to designers, knitters, and artisans. 250g of Italian spun hemp, silk yarn. 5 x 50g hanks in each pack. In Green or Brown. Knits up beautifully using 4mm needles. Has a fantastic handle. Perfect for luxurious spring knitwear. Due to the colours being pretty consistent, dye lot does not tend to matter with mandala yarn. 150g - 590 yards / 540m per cake. Sari Silk Multicolour Yarn. Gorgeous, excellent lustre yarn - l ightly textured. Great for a special project. 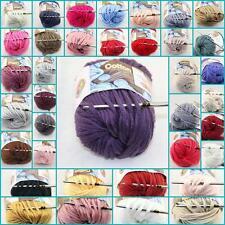 For Knitting, Crochet, Textile Jewellery Making, Doll hair, Weaving or Yarn Art. 100g skeins approx. 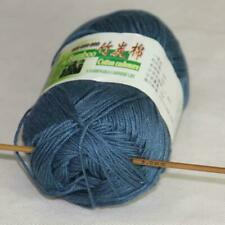 100g OF HAND-DYED DOUBLE KNIT 100% PURE NEW KNITTING WOOL. Approx double knit. Care - Cool machine or hand wash, dry flat. This delicious soft cake yarn is #3 weight (double knitting to us in the UK, light worsted in US lingo) and beautiful blends of colours that take care of colour changes for you. The yarn is dyed with colour changes, not knotted. Due to the colours being pretty consistent, dye lot does not tend to matter with mandala yarn. This delicious soft cake yarn is #3 weight (double knitting to us in the UK, light worsted in US lingo) and beautiful blends of colours that take care of colour changes for you. New listing8 X 100 gram skeins of red cotton yarn with sequins. 8 X 100 gram skeins of red cotton sequin yarn, aran weight. 97% cotton, 3% polyester. 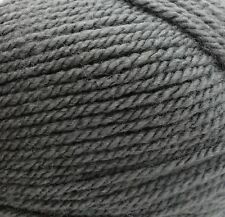 375g OF 4-PLY 100% PURE NEW KNITTING WOOL. Shade - Bottle. Care - Cool machine or hand wash, dry flat. 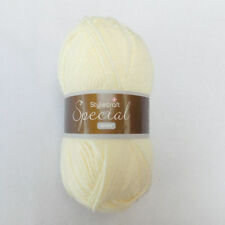 490g OF DOUBLE KNIT SUPERWASH 100% PURE NEW KNITTING WOOL. Approx double knit. Care - Cool handwash, dry flat. If your project asks for more than one skein I would suggest to alternate skeins every couple rows to get even pattern. 295g OF HAND-DYED DK 100% PURE NEW KNITTING WOOL. Suggested needle size - 4mm . Approx double knit. Care - Cool machine or hand wash, dry flat. 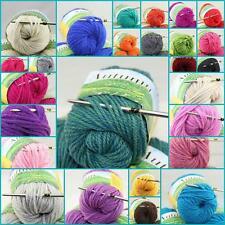 Ella Rae DK Merino Superwash- 5 x 100g hanks col. Carbonite(101) HUGE SAVINGS!! Ella Rae DK Merino Superwash- 5 x 100g hanks col. Marigold (111) HUGE SAVINGS! !